Ernest & Grace trip the light fantastic. The connection between horses and music is not abstract. It’s literal. I was learned this fact years ago riding with a group of friends at a barn party. The sound system was cranked up and Bobby McFerrins’ Don’t Worry was playing. I am sure the song choice was meant to be a joke but as I looked around the arena, all the horses were trotting to the beat, in stride with each other. It was like we were all rubber ducks floating on the same wave in the ocean, bobbing in unison. People didn’t notice but I am certain the horses did. 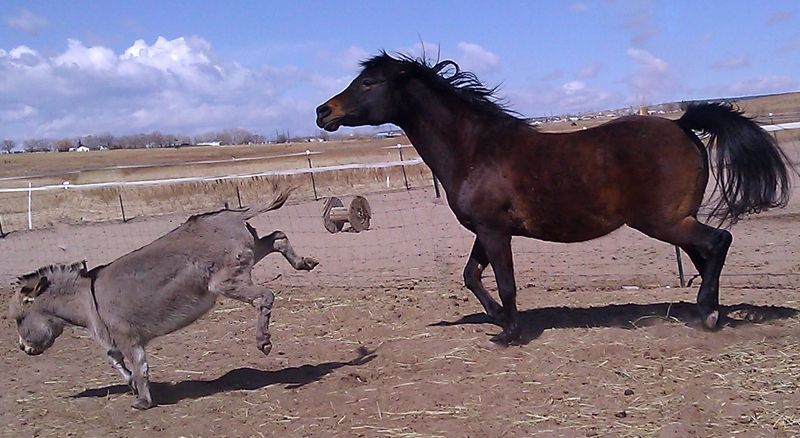 Horses love rhythm. It is obvious since all good things have steady rhythm- breathing, eating, trotting, and cantering. Rhythm relaxes horses. “Without cadence there is no useful riding.” Nuno Oliveira. Conversely, tension and a loss of rhythm is the first sign something is coming undone. A horse might throw his head up, or he breaks stride, bolts or halts. Or maybe he is habitually tight in the poll or back, blocking his ability to transition easily. At a recent Riding to Music clinic, I watched a nervous, tight-backed horse fall fluidly into the rhythm of a song and then actually pause the two seconds between songs, only to catch the next rhythm perfectly. The music appeared to give him confidence- his mental attitude was clearly impacted by his physical movement. Music has a similar effect on riders. I think riding to music is a great training aid- resistance-free and positive. I’ve started playing music in many of my lessons. It might not be the most classical approach but our goal in dressage is a relaxed, forward ride. Maybe music is a positive distraction from getting in our own way- by thinking too much or trying too hard. Or maybe dancing is just fun. Sometimes the study of classical dressage can get a bit stuffy and stuck. It might be time for a horse dance at your barn. Call some friends and crank up the music. Dull school patterns can become canters on clouds. Because when it comes to dancing, hasn’t your horse been a great partner? I’m packing up a wide range of eclectic music for another Riding to Music clinic in southern Colorado this weekend. It is my favorite clinic to give- full of music, creativity and laughing. You know, the kind of environment that improves riding skills. I’ve heard tell of this connection and always understood – but have yet to put it practice. I find myself riding horses at different barns (neither horse nor barn ever belongs to me) – how do you suggest I create a portable means of music that’d be loud enough to hear from the other side of the ring? Also – any good riding songs to suggest? Elizabeth, thanks for asking. This is one place technology is really helping us. No one wants to lug a boombox and then you cant hear it half the time. My suggestion is a more personal sound system. Get a mp3, very reasonably priced and add some speakers() like these for another $10. This is a small light speaker- you can clip it on your saddle or belt, or I put mine on a cord around my neck and wear it under a jacket… but the sound is right with you so you never get out of ear shot. You can ride to music out in the wide open spaces. Affordable and easy to use.